Ask A Filipino! : Do Filipinos have their own script and do they still use it? I once passed by a "Filipino fiesta" near the Moscone Center/Yerba Buena Gardens [San Francisco, CA] and so I checked out some of the booths. I saw these pretty cool shirts being sold with all sorts of weird-looking "characters" -- I mean letters, not people :-) -- which I figured must be from your native alphabet. Am I right? If so, what do you call it and does anybody in the Philippines actually still use it? Thanks in advance for your reply, bud! "Surfer" as in "Internet surfer" or "surfer" as in "California surfer"? If you're the latter, here's a link for you: The Top 10 Surf Sites in the Philippines as compiled by BISEAN. Just thought you'd appreciate knowing there's quite a few surfing spots where I was originally from in case you find yourself feeling adventurous one of these days. Mistakenly, others also refer to it as "Alibata," but this term is really a silly modern coinage by a member of the old National Language Institute, Paul R. Verzosa. Why? Because the term Alibata is a mash-up of alif, ba and ta, which are the first letters of the Arabic alphabet. Now, Alibata would probably be fine for people who are fine with formally calling the Latin alphabet as "ABC"; however, the problem in this case is, Baybayin is NOT even based on Arabic! In fact, Baybayin is a member of the Brahmic or Indic family of scripts, which is not only alphabetic but actually and, more importantly, syllabary in nature: i.e., the letters are actually symbols which represent syllables. The word baybayin is a Tagalog term that refers to all the letters used in writing a language, that is to say, an “alphabet” – although, to be more precise, the baybayin is more like a syllabary. It is from the root baybáy meaning, “spell.” This name for the old Filipino script appeared in one of the earliest Philippine language dictionaries ever published, the Vocabulario de Lengua Tagala of 1613. 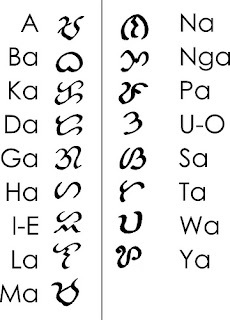 Early Spanish accounts usually called the baybayin “Tagalog letters” or “Tagalog writing.”...[T]he Visayans called it “Moro writing” because it was imported from Manila, which was one of the ports where many products from Muslim traders entered what are now known as the Philippine islands. The Bikolanos called the script basahan and the letters, guhit. I love this question because it means people are talking about baybayin! I immigrated from Cebu when I was two and slowly lost my identity as a Filipino as I grew up. I saw myself as an American who happened to have Filipino roots, not as a Filipino who happened to live in the States. After getting to visit the Philippines as a teen and grown-up, the shift in how I identify who I am has become more balanced. This became even more so after I became a mom and wanted to have more to pass on to my daughter than our Filipino food. It was during this seeking that I came across baybayin and a passion and my business, Philippine Script Designs (www.philippinescript.com) was born. What I find interesting is baybayin seems embraced more by Stateside Filipinos. This may be a misconception on my part but I know that when I talk to native Filipinos about this script it's met with skepticism. They'd never heard of baybayin until coming to the States! Through my business,however, it has been my pleasure to share this aspect of our history and come across other Filipinos who connect to this writing system. They desire to show it in a tangible way. Based on my jewelry business, I think what makes baybayin such a significant expression is that it's a way to express who the individual is (through words, phrases, Biblical verse and names), as well as the history of our culture. It's exciting to see how people are doing this through their clothing, jewelry and tattoos. You have nice-looking products! I know now where to go next time I'm looking for gift ideas! Great news! Baybayin Buhayin is now available as an iPhone app in iTunes Philippines. it's such a shame that Filipinos living in the Philippines never exercise the script. but we can only chose 1, I guess. it's like the Koreans losing their knowledge of Chinese writing practice in exchange of their own alphabet. while the inverse here in our country, we lost our own alphabet in exchange for English/Roman alphabet/whatever. Fantastic goods from you, man. I have understand your stuff previous to and you are just too excellent. I really like what you have acquired here, really like what you’re saying and the way in which you say it. You make it entertaining and you still care for to keep it wise. I cant wait to read much more from you. This is really a great site. I think Baybayin should be preserved for cultural and historical purposes only. It is highly impractical to use today, about 40% of Filipino vocabulary today are of foreign origin, our language has evolved a rather wide spectrum of vocabulary that is incompatible with Baybayin. 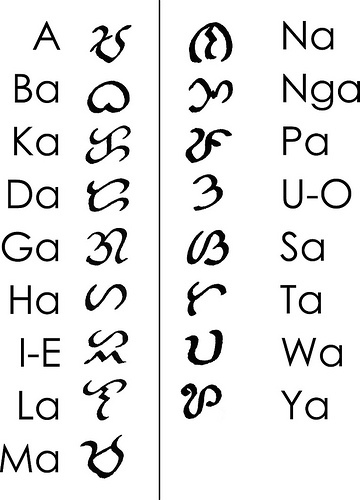 Baybayin would be the Filipino equivalent of the Japanese Mangoyana script which used Chinese characters. The Japanese find it highly impractical to revive the script but preserve it for cultural purposes. I think they teach that alphabeth in 2nd year high school in 80s. I can't remember where but I've read somewhere that there are more scripts used other than baybayin. Does anyone here have any info on those?